Bron Lindgren’s introduction to auto repair was repairing vehicles to “make ends meet” after the birth of his son. He soon found this to be an avenue for the use of his problem solving skills. The courtesy shuttle is one example of Bron’s customer service. Photo credit: Bron’s Automotive. Lindgren always tells his mechanics that before they recommend some kind of maintenance or repair to ask one question. “I tell them they need to ask themselves if that was your wife’s car or your mom’s car on the lift, what would you recommend?” Lindgren said. Lindgren’s motto of always being honest with the customer and treating them fair has been the foundation of a successful business. 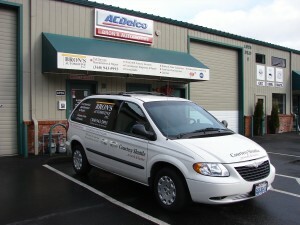 To schedule an appointment, call 360-943-5993.